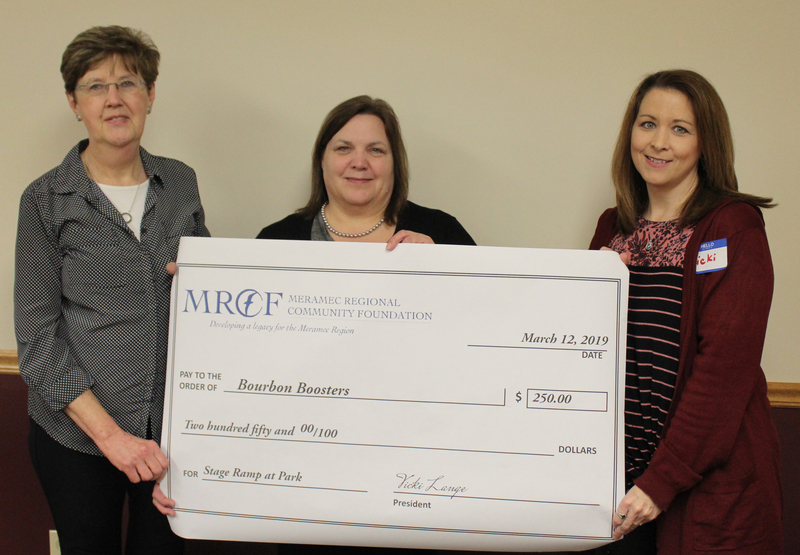 ST. JAMES—Meramec Regional Community Foundation (MRCF) awarded the Bourbon Boosters a $250 grant for its project to upgrade the accessibility a stage in Bourbon park. The check was presented at MRCF’s invite-a-friend luncheon March 12 at MRPC in St. James. This year, the MRCF board reviewed a total of 18 grant applications, requesting a total of $4,414.21 and representing projects in Crawford, Dent, Maries, Osage, Phelps, Pulaski and Washington counties. The Bourbon Boosters was one of six projects selected for funding. The Bourbon Boosters partnered with the city of Bourbon to build a stage in the downtown festival park in 2018. However, the stage was unfinished and required a ramp to be ADA compliant. A permanent stage at Festival Park in Bourbon has resulted in more community groups using the park for activities. The city of Bourbon agreed to build the ramp and finish the stage if the Bourbon Boosters could supply the materials, which they plan to use the $250 MRCF grant to help with. Meramec Community Enhancement Corporation on behalf of Duke Rural Fire Department for a new building. Cutline: Becky Turner and Carol Hofstetter (left to right) of the Bourbon Boosters accept the ‘big’ check and the real check from MRCF Chair Vicki Lange.